We have seen how the 1970s saw filmmakers freed from the shackles of censorship and ready to make films which reveled in the morally gray. The 1980s saw a much more upbeat Hollywood with much more confident and relaxed heroes, sure of who they were and what they wanted. The 1990s saw the advent of CGI proving to be a huge attraction to the cinema-going public. So what of the 2000s? What changed in the years between 2000 and 2009? 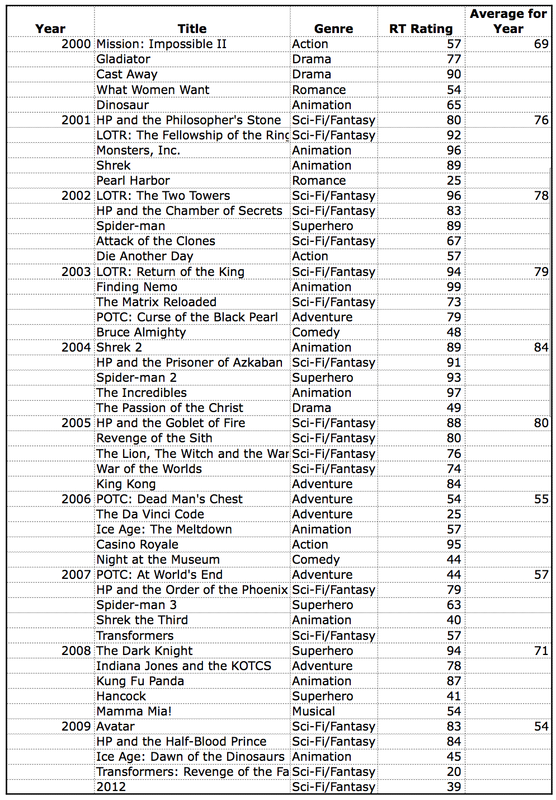 These graphs tell us one side of a story, a decade which saw a shift towards far more sci-fi/fantasy and superhero movies, as well as a sustained love for animated movies (although, unlikely the 1990s all the films in this genre are now CGI). In terms of how critics and audiences differ, the story is much the same as the previous two decades. In the 2000s, the average of all fifty films researched was 70%, identical the the 90s, fractionally below the 80s (73%), but well below the 70s (81%). This shows us movies are not “getting dumber”, they are merely of a lesser quality than they were in the 1970s, something that has been the case for the past thirty years. Finally, any film historian will tell you the 1970s were the exception rather than the rule in terms of the quality of Hollywood movies. To put it another way, it is not that movies in the 21st century are dumber, but rather that movies in the 1970s were smarter than at any other time in Hollywood’s history. This, however, only tells a fraction of the story. The most telling statistic is this. In the 1980s, sequels (and I’m not including remakes here) made up 34% of the films in my results. In the 1990s that figure dropped to 20%. By the 2000s? 50%! That’s right, half the movies featured are sequels/prequels to existing movies. Things get even more interesting when we examine all the films that are not sequels. Movies like the first in the Harry Potter, Spider-man, Lord of the Rings, Pirates of the Caribbean, Da Vinci Code, Transformers or Chronicles of Narnia series. Not forgetting Mamma Mia, War of the Worlds, and King Kong. What do all these (original) movies have in common? Brand recognition. In the 2000s the importance of brand recognition was one of the biggest single changes to which movies got made, and consequentially what was most successful at the box office. Studios (and ultimately audiences as well) became a lot more conservative in what they were prepared to spend their money on. So if there was a successful Broadway musical,theme park ride, book or toy already familiar to the general public this was deemed perfect for the Hollywood treatment. 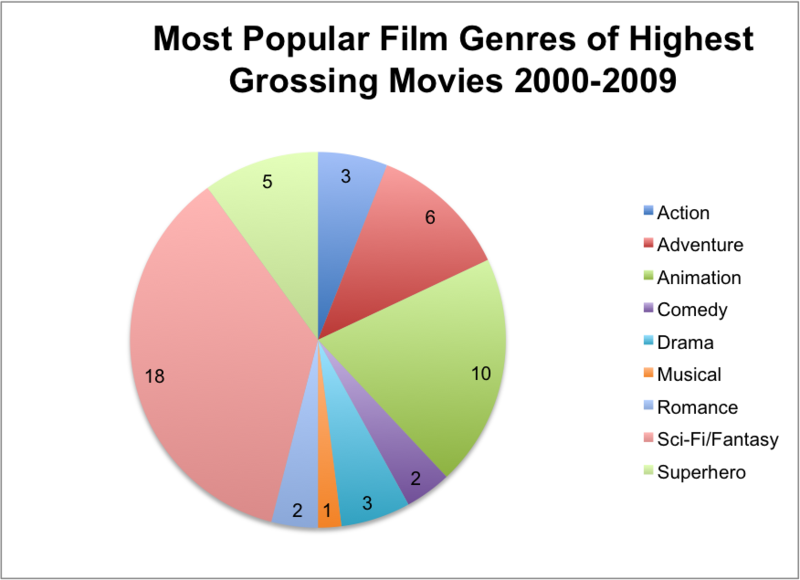 The other significant change in the 2000s is the lack of “R-Rated” movies on the list, i.e. films made explicitly for an adult audience. This has been a much more gradual change. However, having been so glad to get rid of censorship forty years ago, it has ironically seen Hollywood come to embrace its own form of self-sanitisation. Just 3, or 6%, of the popular films in the 2000s were “R-Rated” (Gladiator, The Matrix Reloaded and The Passion of the Christ). Compare this to 34% of movies in the 1990s, and you can see a significant change has taken place. Concrete examples of this can be seen in the remake of Total Recall, an R-Rated movie in the 1990s, where as the most recent version is PG-13. Likewise the two most recent Die Hard movies have had a PG-13 rating, a change from the much more daring original three films. Hollywood is “playing it safe”. By making movies with instant brand recognition, as well as a PG-13 or below rating, they are aiming to appeal to as wide an audience as possible. Will this change? Only if audience members show their dissatisfaction with the current state of affairs by choosing a different type of film. So the next time you pay to see a terrible sequel to a terrible movie, don’t get angry at Hollywood, get angry at yourself. You chose the safe option. Why not be more dangerous next time? This entry was posted in 2000s, Box Office, movie, statistics and tagged box office, Film, movies, statistics. Bookmark the permalink.